As of this writing, there are 302 customer comments and 61 answered questions for the Lightshare LED Blossom Tree. I've read the customer feedback and then condensed the results into this review. I hope that this review helps you when shopping for the best outdoor Christmas decorations to add to your yard. 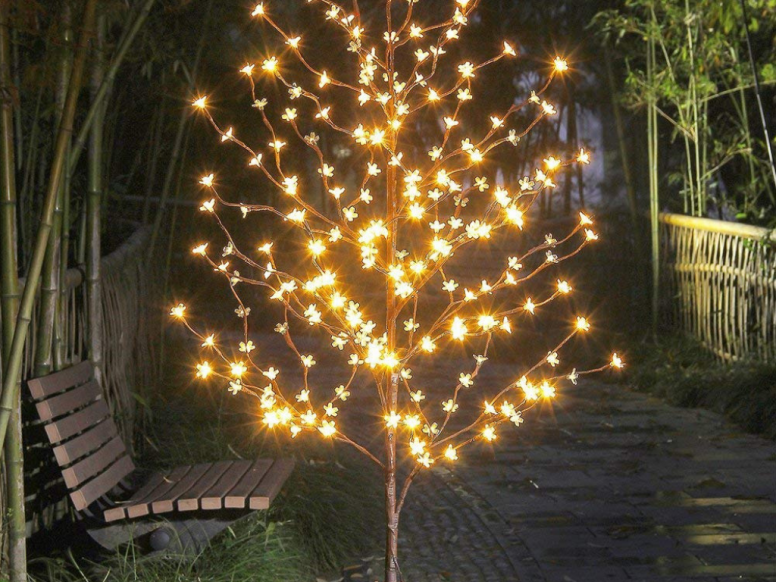 The Lightshare LED Blossom Tree comes with 6.5 feet of lights and it is decorated with 208 LED lights. Each light is covered with a blossoming flower. This outdoor Christmas decoration is easy to put together. It is bendable for any shape that you want. It is suitable for indoor and sheltered outdoor use. The Lightshare LED Blossom Tree is a nice Christmas decoration to use inside in addition to outside. A customer said, "This is such a fun & versatile piece! I used it in my 5-year-olds bedroom, but I wanted to keep it for myself! It would be cute in any room of the house! We've gotten so many compliments on it." Some people mentioned the plastic smell. If you will be using this outdoors, it probably isn't an issue, but if you will be using it indoors and are bothered by smells, it may be a problem. A customer shared, "I am at the front desk in my office, and my space was pretty sparse after the person before me moved to her new office. I am by no means a decorator but thought something like this would really spruce up my area. Wow. It's gorgeous, it brings life to the area and my coworkers have raved about it, and now they want one of their own! Very easy to put together, the only complaint is the bad plastic smell. But so so so pretty. Have recommended to all my coworkers." The Lightshare LED Blossom Tree does not come with a remote control. If this will be an outdoor Christmas display, you may want to purchase a remote control. A customer shared this feedback and advice, "This tree is on our front porch and gives off such a beautiful light. It is just so pretty when people come to the front of the house. It is windy here so I wrapped weights around the bottom and made a little burlap tree skirt to go around it to hide the base which is not that attractive. Years ago we bought a remote control plugins for outdoor use and I suggest doing that if you have to plug it into an awkward spot as it does not have an on/off switch. All we have to do is control it with a remote. If by any chance lightshare reads these reviews I wish they made a bigger one (8 feet at least). I would buy one in an instant." The price is great for The Lightshare LED Blossom Tree but the quality and longevity is questionable. In this case, you do get what you pay for. This doesn't mean that it can't be a beautiful Christmas display. Just don't expect a high-quality item. A customer shared, "For the price it’s nice. The base does not seem very durable. Not sure how long it will last. Considering potting it. Bought originally for my living room but looks a little cheap the stem is wrapped with brown flower tape. I will be buying a different tree light and putting this in my room. Lights are bright and overall worth my $40. Should have splurged a little more $$ for a chic look." Even though many people use this is as a Christmas display, the nice thing about it is that you can keep it up year round. A customer shared, "This is a very beautiful item. I used it as a Christmas tree because of my cat. Everyone, myself included thought it was elegant. Friends recommended I leave it up all year, and I may because you can read by it." Some trees did not stay lit long. Here is one of the reports, "This item was purchased to be a focal point decoration at a party (it was meant to be a "Wishing Tree" for people to hang tags with personal well wishes). I tested the product upon delivery and it lit up fine. Got to the site of the party, plugged it in (for the 2nd time ever) and it lit for about 15 seconds before going black. It flickered a few times, even after being unplugged (no mention of a battery anywhere, so not sure how that happened). The item was plugged back in and about an hour later it came back on for another 15-20 seconds, then back to black. It never came back on, and the main decoration for the party sat dark the entire evening. Very disappointed, as I was especially careful not to over-bend any of the wires/branches. It seemed as if there was a fuse problem, but there is no way to access or replace a fuse - if that's even the issue. Returning the tree for a refund." The Lightshare LED Blossom Tree does not have an on and off switch. Unfortunately, it has to be plugged in and unplugged in order to be turned off and on. A customer shared, "I like the tree light, but don't like that there is no switch to turn it on and off. I searched everywhere on the tree "trunk" and chord and there is no switch to be found. I haven't been able to use the light because my receptacle is behind the couch and it it too inconvenient to move furniture every time some light is needed. I would have returned this product if I had realized there wasn't a switch before throwing the packaging away." Some customers wished this tree was bigger, but others liked the small size. Because it is only 6 feet high, it does give you many more options of where you'd like to use it. Most ceilings are much higher than 6 feet, so that means you can use it inside. Also, as the following customer stated, you can even travel with it. The customer said, "Decorating my living room and liked it so well we took it camping in our RV; we set it up outside and our family who came to camp with us could locate our site immediately, lol!.. the last thing I like is that you have to use the plug to turn it off and on there’s is no switch, which for me would make that a 5 star product. Regardless, it’s a very nice addition to our decor, I want to buy my kids one for Christmas, the price is right!" You may need to spend some time removing tape that is on the tree. A customer commented, "I bought this because of the reviews and it arrives and is covered in tape that obviously needed to come off. Then there is a massive amount of electrical tape covering it with no mention on what to do with all this tape? If you leave it alone you can't arrange the lights but when you cut away the tape, the lights stop working. There is no mention of the tape in the directions. Went from unpacking to the trash in 5 minutes." The Lightshare LED Blossom Tree has 6 1/2 feet of lights and it is decorated with 208 LED lights. Each light is covered with a blossoming flower. This outdoor Christmas decoration is easy to put together and it is bendable for any shape that you want. It is suitable for indoor and sheltered outdoor use. Some complaints that came in about this Christmas display, were that there is no on and off switch. You will need to plug it in and unplug it in order to turn it off and on. Also, it may arrive with a lot of tape that you will need to take off. Other complaints included the plastic smell and also the quality. Other than that, The Lightshare LED Blossom Tree is priced to sell. Here are some top questions that I found for people considering buying the Lightshare LED Blossom Tree. Are the branches sturdy enough to hang ornaments on? Yes, you can hang ornaments on the Lightshare LED Blossom Tree. Would this Christmas decoration be strong enough if I take it apart often? Yes, but if you bend it too much it may become weak. Does this tree mechanically twinkle? No, it does not twinkle.